9x12, xv + 222 pp. This edition presents two previously unpublished compositions by the Boston composer George Whitefield Chadwick (1854–1931). Since its 1879 premiere, the Rip Van Winkle Overture, in both the original version published here for the first time and its revision from the 1920s, has generated universal admiration. 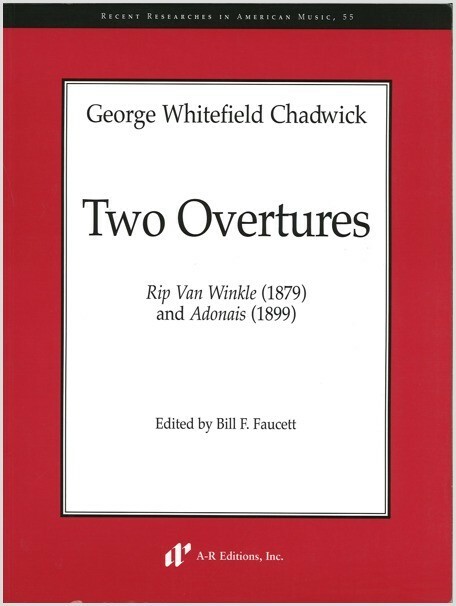 Adonais, Elegiac Overture (1899), composed twenty years later, is largely unknown, although Chadwick himself counted it among his finest compositions. Both overtures effectively demonstrate Chadwick’s command of traditional forms, his brilliant melodic imagination, and a superb gift for orchestration. The accompanying essay examines the history of both overtures, featuring a detailed formal and stylistic analysis that takes into account Chadwick’s own thoughts on them and their reception histories. Charles S. Freeman, Journal of Musicological Research, March 2008.